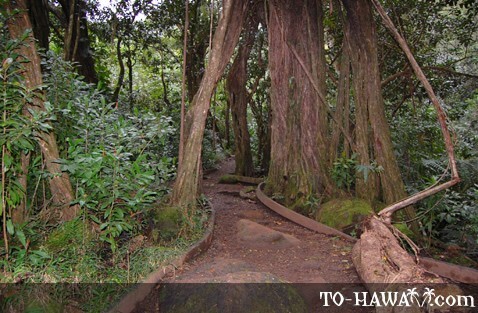 The Manoa Falls trail (see more photos) on the island of Oahu, Hawaii, is one of the most popular hikes in the Honolulu area, mainly because it is easily accessible from Waikiki, either via car or city bus, and it is classified as an easy hike. 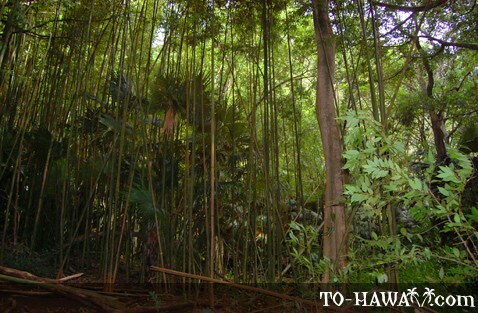 A short drive out of Waikiki towards Manoa Valley and you can be surrounded by a tropical bamboo and rainforest. 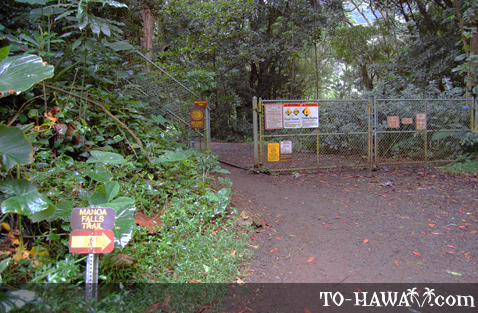 Many Oahu tour hiking tour operators take their guests here. 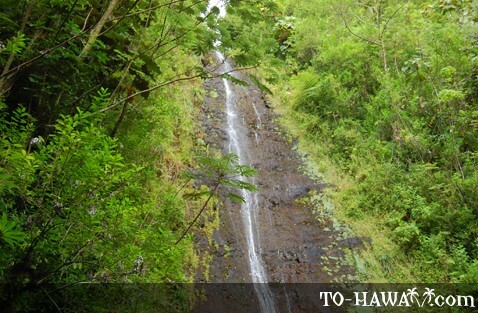 The water cascades down from the mountain into a small pool. 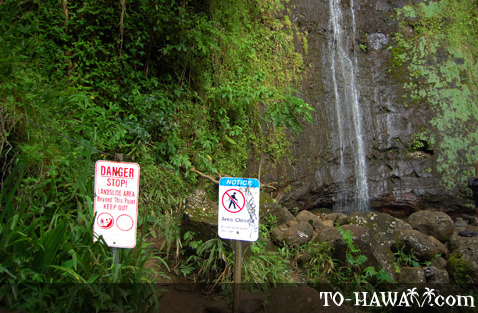 Even though it looks inviting, it is not recommended to swim in it because of the risk of rock slides, which have occurred in this area. Also, it isn't safe to drink the water because of leptospirosis contamination. But it is a nice spot for taking pictures. 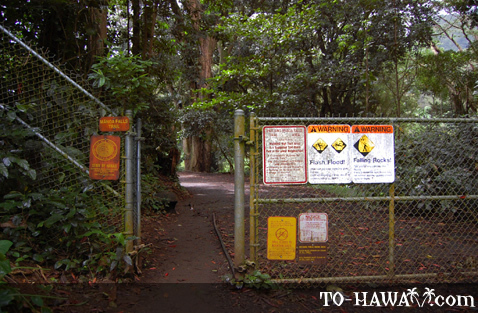 The entire trail is about 1.6 miles (2.6 km) out and back. It can be slippery if it is raining. 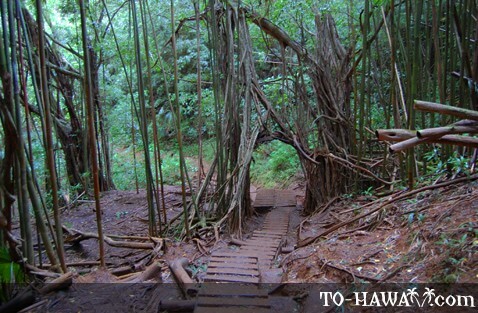 It rains more often here than in Waikiki and along the coastline. 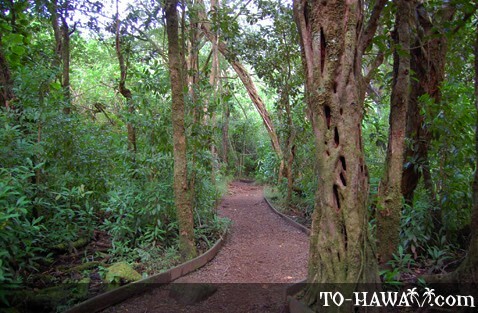 The trail is in a rainforest, so even if it's dry and sunny in Waikiki, it often times is raining here. Check the conditions before you go (a quick glimpse towards the mountains will give you the answer – if you see dark clouds, it is probably raining in the valley). 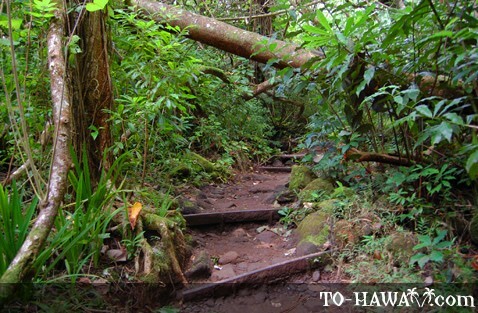 Bring a water bottle and insect repellant with you and wear comfortable hiking shoes. You will have to climb over some rocks along the way. Even though the hike is classified as easy, it may be challenging for people with knee problems or other conditions. 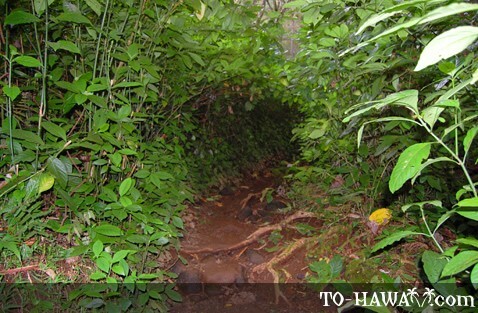 Directions: Manoa Falls is located at the end of Manoa Road in Honolulu's neighborhood of Manoa. Take the city bus number 5 all the way to the last station. 1st trip to HI. 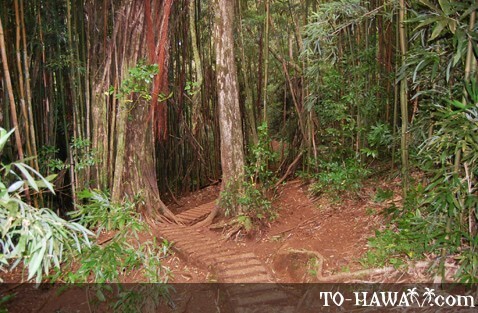 Relatively easy hike with 2 relatively bad knees and being 56y.o. Excellent guide (R. Fujita). Have gorgeous pictures even with my ancient Kodak. Fascinating landscape and history. alot of fun, but it was very slippery and muddy when i went. made the mistake and went in flip flops. they broke so did it in bare feet. still enjoyed the hike and the beautiful surroundings. 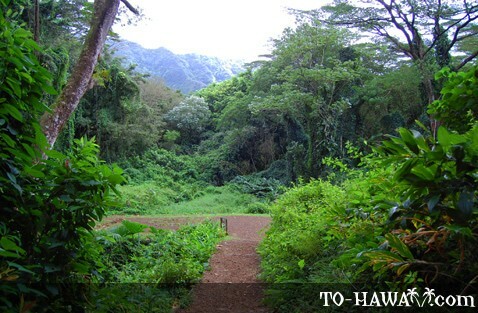 I walked from close to Waikiki out to the Falls and back...a very long walk in the very hot sun but enjoyed the beautiful mist of the mountains on my arrival to the Manoa Valley. As has been said, it did pour just before my arrival into the valley, but just wonderful on the trail up to the fall. A bit muddy yes, uphill climb depending what shape you're in. Easy for me, 54 year old and already walked a couple of hours before hand and walked all the way back home. 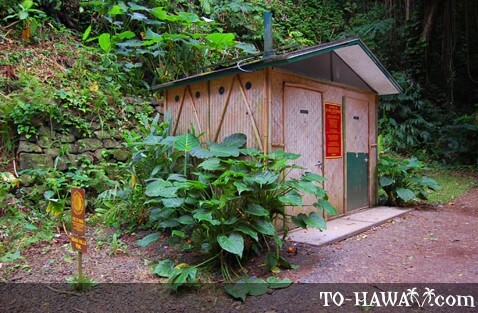 A lovely rainforest venture to enjoy. A must! 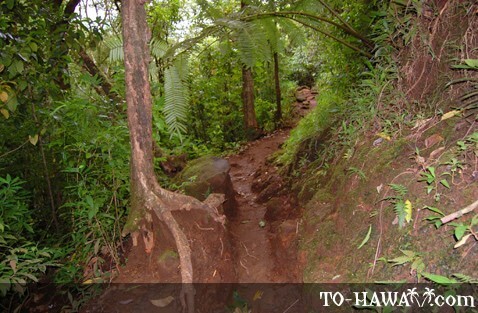 It was a very nice and simple walk uphill. It was muddy and got muddier as you went up in elevation but that is normal. 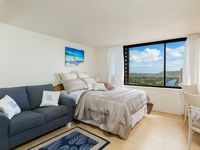 It is very close to downtown Honolulu but it lets you see the countryside of Hawaii I expected to see. 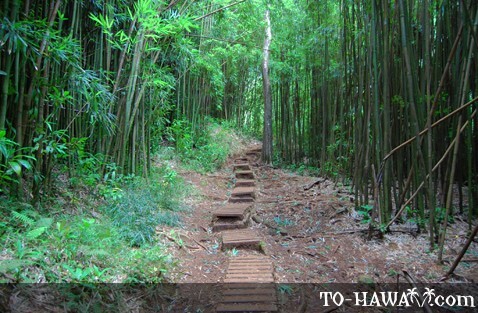 The foliage is very diverse and part of the trail goes through a bamboo forest. Take water and maybe a some snacks if you are diabetic. Maybe not quite as easy as you have been led to believe! 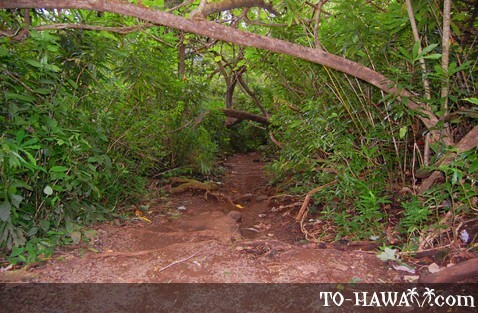 Definitely an uphill hike for the most part, on a muddy tail. 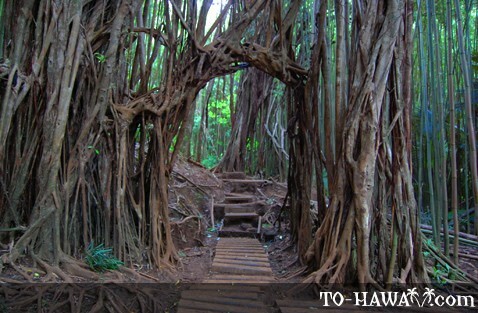 Some areas will require 18" steps up over exposed roots. Running shoes at the minimum, hiking boots would be better, and take along lots of water for the summit. 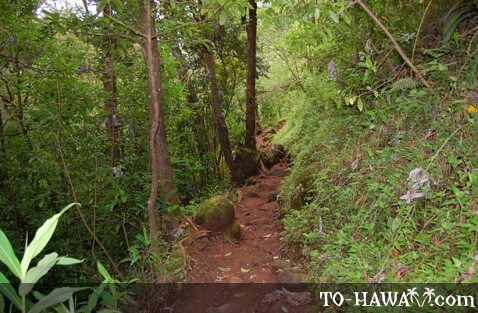 An easy hike if you're in decent shape. Takes about 40 minutes one-way. The trail had been a bit muddy when I went because it had rained the days before, but seeing the waterfall was a great reward.